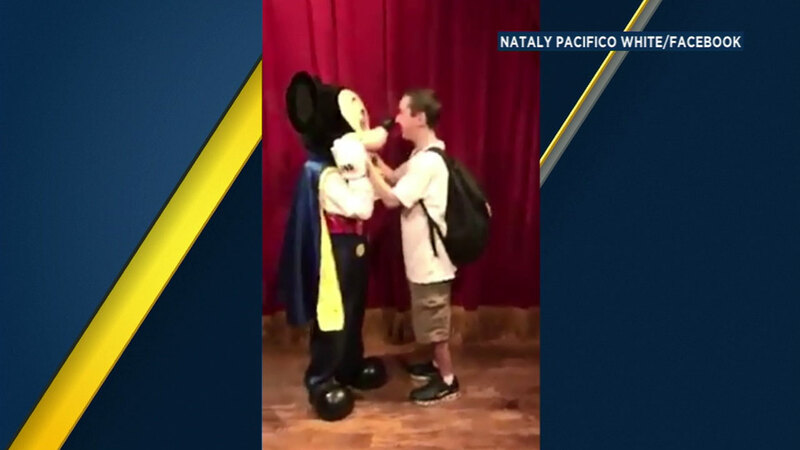 ORLANDO, Fla. -- A blind man from Brazil shared a special moment with Mickey Mouse when he visited Walt Disney World in Orlando, Florida. Basilio Santana, 21, lost his vision when he was 9 years old because of Devic's syndrome, a disorder that causes the immune system to attack the optic nerves and spinal cord. Santana traveled to Disney World with his mother and a large group of tourists from Sao Paulo, Brazil. His tour guide, Nataly White, took cellphone video of the touching moment when Santana met Mickey. "This moment made me cry soooo bad! You can hear me crying behind the camera," she said. Mickey Mouse holds Santana's hands and takes him to center of a stage. There, Mickey guides Santana's hands over his face and ears. While Santana is feeling Mickey's face, Mickey mentions he knows a little Portuguese and speaks to Santana in the language. The two touch noses and then Santana and Mickey share a big hug. Santana's mother jumped in on the moment, too. White said she began crying even harder when Santana's mom hugged Mickey, repeatedly thanked him and said, "I love you, Mickey!"